Sample fine food in the hotel restaurant, unwind on the terrace or energise yourself in the gym - this excellent hotel has plenty to suit all! 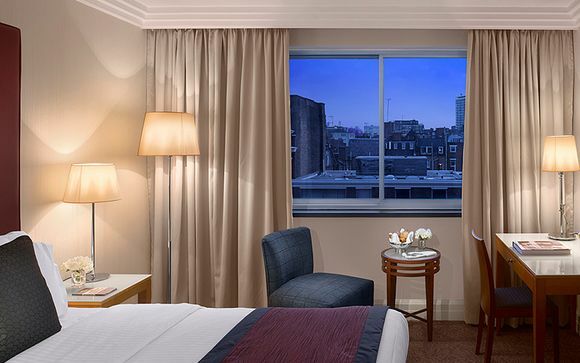 Stay conveniently near Oxford Street at this hotel's London city centre location. In the heart of the West End, the Radisson Blu Portman hotel boasts an address within walking distance of a variety of transportation options and attractions. 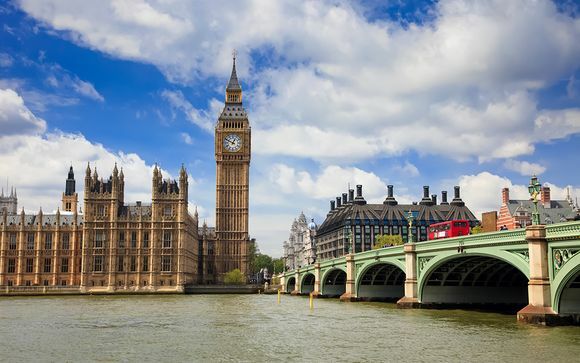 The hotel's guests can visit London city centre attractions like Big Ben, the popular Oxford Street, Selfridges, Hyde Park and even Madame Tussauds Wax Museum. The 272 comfortably equipped rooms and suites showcase stylish design and amenities like high-speed, wireless Internet access, air conditioning, and coffee and tea facilities. Enjoy innovative international cuisine at the Portman Corner Restaurant, and sip on well-mixed cocktails at the Portman Bar & Lounge, or on The Terrace. The hotel boasts a fully equipped fitness centre and outdoor tennis court along with everything you could need for a remarkable stay in a renowned city! You can choose to upgrade to a Junior Suite at the next stage of the booking process for an additional fee. Approximately 23 m² in size, the spacious Superior Rooms are complete with a queen size or twin beds (allocated locally). Boasting the modern amenities and comforts one would expect from a 4* hotel, the Superior rooms are the ideal base for your time in London. 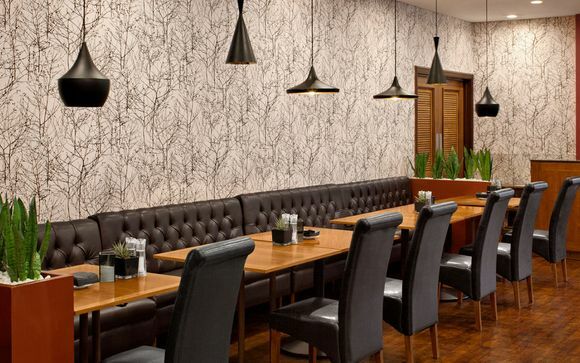 As the hotel's main restaurant and a London favourite, the Portman Corner boasts an open and inviting atmosphere. Fresh, seasonal ingredients and innovative dishes characterise the dining establishment, which is opened for breakfast, lunch and dinner. Try the juicy rib eye steak cooked at perfection or the sea bass and indulge yourself with our traditional salted caramel cheesecake. Start the day with the delicious Super Breakfast Buffet, stocked with hot and cold dishes. Freshly prepared omelettes, a selection of teas and coffee, and healthy options are available. As the only hotel in the area with alfresco dining, the Terrace is a popular spot for tourists and locals. Enjoy an early morning breakfast, lunch, dinner or even just a drink with friends. The terrace is also a premier spot for small events for up to 40 guests. Attentive staff service only enhances every dining experience. Stop in to the Portman Bar & Lounge at almost any time of the day to enjoy a cocktail, glass of wine or beer. The cosy, traditional atmosphere is perfect for socialising with friends or colleagues over a nightcap or even before a night on the town. If you are hungry, the well-crafted menu features favorites like the Portman Burger or a light Caesar Salad. Club Twenty Two, is on the second floor in the east wing. It houses modern cardiovascular equipment, an Olympic squat rack, a dual-adjustable cable machine and functional training equipment. Personal trainers can create individualised exercise, nutrition and lifestyle programmes.